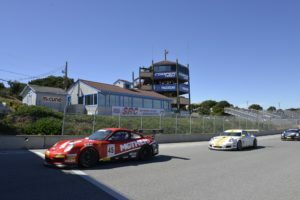 Monterey, Calif. – Hailing from Los Gatos, California, Pirelli GT3 Cup Trophy USA Championship leader Robert Todd was feeling right at home on Saturday as he took a convincing victory at Mazda Raceway Laguna Seca in Race 5 of the 2016 championship. The BR Racing driver grew his championship points lead with his fifth podium appearance of the season and his third victory of the year following his double-win weekend at Circuit of the Americas in the Pirelli GT3 Cup Trophy USA season-opener. The win didn’t come easily for Todd as TruSpeed Autosport’s Jason Godfrey, who qualified on the pole in his No. 13 Justice Brothers-liveried Porsche, led through the opening laps of the race as the birthday boy played host to a large group of family and friends to celebrate the Laguna weekend. But Todd never let Godfrey pull away, and when the Diamond class encountered lapped traffic just five laps into the race, the GT4 machines battled for position ahead of the Diamond class race leaders and Todd was able to capitalize on the traffic and sneak by the No. 13 of Godfrey to take over the race lead. Todd never looked back and it looked like a sure podium finish for Godfrey until the final lap when fluid on the track from a car off in Turn 2 saw the No. 13 Porsche spin with Godfrey ultimately bringing it home seventh at the finish. 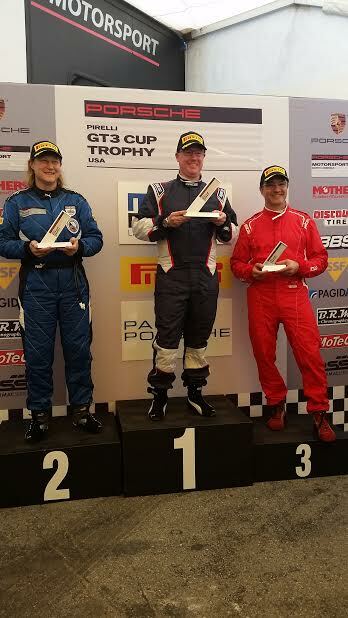 Air Power Racing’s Desiré Wilson and GMG’s Dino Crescentini rounded out the overall class podium. 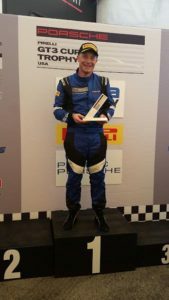 It was once again TruSpeed Autosport’s Tom Haacker that took top honors in the Platinum class for his fourth Pirelli GT3 Cup Trophy USA victory of the year in a newly revitalized Mother’s Porsche machine. Jim Walsh, who scored the pole position for Race 5 in his Red Dog Racing entry, took home the runner-up position and Annand Sharma drove his Chazer Clothing Porsche to a third place podium finish. John Krieg started on the front row but sustained damage during the race and finished fourth. 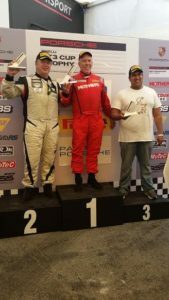 The Platinum Masters division saw a thrilling battle for the race lead between TruSpeed Autosport’s Ray Shahi and Joe Sposato, with the two setting laps within tenths of one another. The race ultimately came down to a final restart after a caution period, and Robert Rodriguez snuck through for a surprise win in the No. 69 P7 Racing Porsche. Rodriguez was making his return to Pirelli Cup GT3 Trophy USA action for the first time this year and made it a big one with the victory. Sharing the Platinum Masters podium was Joe Sposato who took his No. 28 Allstar Fire Equipment/Scott Air Pak Porsche to third at the checkered flag. 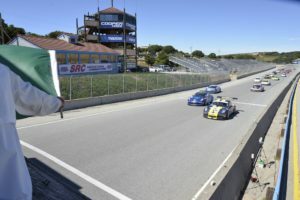 Making his Pirelli GT3 Cup Trophy USA debut at Mazda Raceway was David Donohue in the No. 10 Porsche of Colorado Springs machine. He opened the race from the pole position and led flag to flag to take the win. “I drove hard early on and the car was very good,” said Donohue. “The guys did a great job preparing the car. We had some issues yesterday. We were a little worried because it was Friday the 13th, and it’s a partially green car, and the VIN ends with 666 so we had the deck stacked against us! It was a nice result. Once again paving the way to the Silver Masters victory was Steve Goldman in the No. 1 Seek Thermal Porsche. The result marked Goldman’s third consecutive Silver Masters victory. 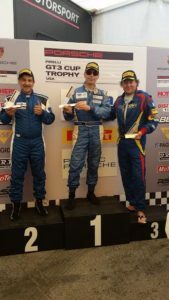 Chris Vivolo finished runner-up for Competition Motorsport in the No. 44 Hampton Inn Porsche with Mike Sullivan bringing his No. 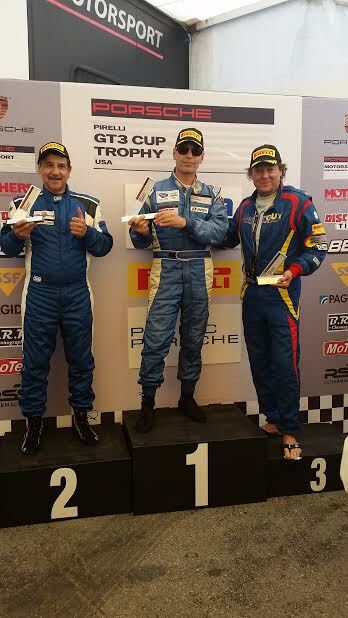 62 Pacific Porsche machine to the checkered flag third in line for an all Competition Motorsport podium. Another day of race action is on deck Sunday at Mazda Raceway Laguna Seca with all five classes returning to competition with Race 6 set to start at 12:55 PM local time.